AUSTIN, Texas, April 16, 2019 (GLOBE NEWSWIRE) -- Gotransverse, a leading provider of enterprise quote-to-cash solutions, received the highest score ranking first in the Enterprise Product category among sixteen of the leading agile billing solutions in the latest MGI 360 Market Ratings Report for Agile Billing Solutions. The Gotransverse platform received one of the top rankings for overall agile monetization for the enterprise, rating above its peers in other categories including: Management, Strategy, and Finance. Gotransverse offers an intelligent billing platform that helps companies boost revenue by implementing subscription and consumption-based pricing models on a massive scale. The Gotransverse agile monetization platform was designed to help businesses increase revenue and shorten product and service time-to-market by automating complex billing models based on subscription or usage-based scenarios while integrating into other business systems and sophisticated analytics. 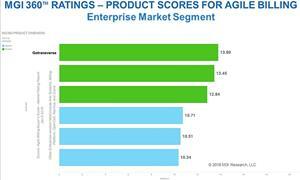 Gotransverse received the highest product score for the enterprise market segment. “Gotransverse is the top-ranked enterprise product in the Agile Billing Buyer’s Guide because of its strong solution for companies seeking sophisticated recurring revenue monetization capabilities across a mix of physical and digital goods and variety of pricing modalities,” said Andrew Dailey, Managing Director at MGI Research. Founded in 2008, Austin-based Gotransverse provides cloud-based software that enables companies in any industry to operate as a subscription business model, including the often-challenging aspects of usage-based pricing and monetization at a massive scale. Founded by globally recognized billing experts, the company offers an intelligent billing and subscription management platform that automates the subscription quote-to-cash process, including billing, rating, collections, mediation, analytics, and revenue recognition. For more information, visit http://billing.gotransverse.com/lp/mgi-agile-billing-solutions.html.